Few bands get to enjoy the impact in an entire career that Frankie Goes To Hollywood managed to achieve in just their first few months. They orchestrated three No.1 UK hit singles with their first three releases – smashing a chart record that hadn’t been seriously challenged for two decades; launched a multi-platinum album; sparked a summer fashion sensation and generated enough controversy to fill the newspapers for weeks. When BBC Radio 1’s Mike Read infamously questioned the decision to play ‘Relax’ on his breakfast show, it was enough to propel the disc to a five-week chart-topping run. Smart marketing, with a string of remixes and special editions hitting the shops, and that daytime Radio 1 playback ban ensured the song stayed in the Top 40 until the release of the band’s follow-up, ‘Two Tribes’, in June 1984, whereupon ‘Relax’ started to climb again, eventually peaking one place lower than the top spot just as the schools broke up for the summer holiday. At that point ‘Relax’ had been in the Top 40 since 7 January – and wasn’t to finally drop off the list until September. The band had made their British radio debut in November 1982, but it was an appearance on Channel 4’s The Tube that sealed their fate when it attracted the attention of legendary pop producer Trevor Horn, fresh from the success of Dollar and ABC. The former Buggles frontman could sense something special about Frankie’s self-penned track ‘Relax’, which captured the Hi-NRG dance sound then gaining national momentum, but lacked the production sheen that it would need to secure a commercial breakthrough. Lead singer Holly Johnson, who had played in Liverpool band Big In Japan and released a couple of unsuccessful (but now highly collectable) singles at the dawn of the decade, sneered and snarled his way through the suggestive lyrics, performing with two scantily clad female backing dancers and supported by the rest of the band – backing vocalist and dancer Paul Rutherford, Brian “Nasher” Nash on guitar, Mark O’Toole on bass and Peter “Ged” Gill on drums – all decked out in gear more familiar on the fetish scene. 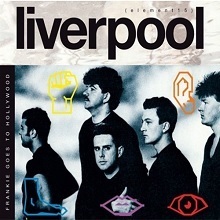 Trevor Horn effectively rebuilt the entire track, using Holly on vocals but largely ignoring the contribution of his bandmates, who, like the lead singer, all came from Liverpool. It became the first single to get a release on Trevor’s ZTT record label, a business he had launched with New Musical Express writer Paul Morley and businesswoman Jill Sinclair. With a mission to create a stir to complement the song’s risqué lyrics, ‘Relax’ was packaged in a suggestive picture sleeve and promoted with a daring video clearly not designed to air on children’s Saturday-morning television. The single’s slow climb up the national chart from November 1983 was given a boost when the band were picked to appear on a new year’s edition of Top Of The Pops, whereupon its progress started to explode, rising from No.35 to No.6 the week after their appearance. Mike Read’s subsequent intervention meant the song, which had enjoyed steady radio support until that point, was pulled from the playlists (and only started to sneak back onto broadcasts at the end of the year). Frankie Goes To Hollywood bemused the critics who were unable to pigeonhole either their sound (a slickly produced blend of Hi-NRG synths and choppy rock rifts) or their image (the theatrical flamboyance of Holly and Paul, paired with the brooding good looks of Mark and the jack-the-lad charm of Nasher and Ged). By March 1984, ‘Relax’ had achieved platinum sales in the UK and most of Europe, with a later stateside Billboard peak of No.10 achieved the following year. ‘Two Tribes’ was the band’s follow-up and arguably exceeded the statistical success of its predecessor with a staggering nine-week run at the top of the UK charts. Avoiding the sexual controversy this time, its still-daring video, directed by Godley & Creme, played on the cold-war paranoia of the time, with actors playing the East and West leaders, Ronald Reagan and Konstantin Chernenko, slugging it out in a gladiatorial arena. Once again the release was supported with dozens of picture discs, cassingles, remixes and special editions. Designer Katharine Hamnett’s T-shirts had even provided the inspiration for a range of Frankie Says T-shirts that became fashion staples for on-trend teenagers across the summer of 1984. Anticipation built for the band’s debut LP during the autumn, and its eventual appearance, in October 1984, caused a retail sensation, with shops ordering more than a million copies in advance. That Welcome To The Pleasuredome could only manage a single week at the top of the album charts signaled the start of a shift in the band’s seemingly untouchable winning streak. The 18-track double-album featured a handful of covers, including Bruce Springsteen’s ‘Born To Run’ and the standard ‘Do You Know The Way To San Jose?’, but critics claimed that more attention had been paid to the record’s lavish packaging and predictably ambitious marketing campaign than the quality of the songs. Despite the attacks, the album did respectable, if not stellar, business worldwide and yielded a third UK No.1 with the seasonal ‘The Power Of Love’, once again supported by a Godley & Creme video (this time without any appearance from the members of the band). True to form, the fact that the video depicted the Nativity was enough to cause another (this time, milder) stir. It managed a single chart-topping week at the start of December, securing the band a then -joint record with Liverpool stablemates Gerry & The Pacemakers, who had managed a similar feat with their first three singles at the boom of Merseybeat in the early 60s. 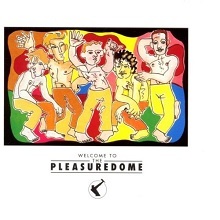 The final release from Welcome To The Pleasuredome was the album’s title track, which peaked at a still-very-respectable UK No.2 in March 1985, soon after the band had been decorated with a pair of statutes at the Brit Awards. The group spent the rest of the year on a long international tour, while 1985 also saw success in the US, albeit on a more modest scale than back home. ‘Two Tribes’ and the album’s title song all scraped into the Top 50, while the LP peaked at US No.33 in a 27-week run. A comeback appearance at the Montreux Rock Festival, in May 1986, saw Frankie smashing their instruments at the end of the set and whipping up the national tabloids once more, but it seemed to mark a slightly hollow start to the campaign for the band’s second LP, Liverpool, which hit the shops in October of that year. By then the lead single, ‘Rage Hard’, had peaked at UK No.4 in a seven-week run and missed the US Billboard listings altogether. Liverpool reportedly cost even more than its ambitious predecessor to make, and its subsequent UK peak of No.5 (and No.88 in the US) was seen as a commercial misfire. Two further singles, ‘Warriors Of The Wasteland’ (peaking at UK No.19) and ‘Watching The Wildlife’ (stalling at UK No.28), failed to re-energise the record’s sales and a well-received tour was to prove the band’s swansong. ZTT announced that Frankie were taking a hiatus from spring 1987, but that statement’s credibility was soon shattered when Holly Johnson announced that he had signed to MCA Records. The following year’s court case between Holly and his former label proved controversial, with the singer awarded costs and a significant victory over ZTT. While Paul Rutherford released some mildly successful dance tracks that year, Holly spent it locked away in the studio creating Blast, which was released in May 1989. The album entered the UK charts at No.1 after ‘Love Train’ had been a substantial hit. Further smash singles maintained its sales and it seemed Holly had landed another winning streak, but his follow-up, 1991’s Dreams That Money Can’t Buy, was a commercial flop and failed to produce any major hits. Holly’s 1993 revelation that he was HIV-positive (at a time when the diagnosis was still often a death sentence) created fresh controversial column inches, but it didn’t harm sales of a later best-selling autobiography. That year also saw the release of a number of remixes of the band’s biggest hits, many of which made the UK singles chart and helped support the first of many greatest-hits compilations. Attempts to secure a band reunion across the years since have failed, with Holly refusing to take part in the projects while maintaining a steady musical profile, including the 2014 release of his well-received album Europa, and an ongoing itinerary of live performances. Frankie Goes To Hollywood enjoyed a huge career in a relatively short space of time. After Band Aid’s charity record, ‘Relax’ was 1984’s best-selling single – and for many it is the true sound of that spectacular year when George Michael, Madonna and Prince were reshaping the commercial landscape in the world’s major music markets. The band may not have enjoyed those artists’ longevity, but ‘Relax’ arguably made a greater long-term impact than any of the tracks from their extensive catalogues, capturing the experimental, accessible and playfully controversial spirit that defined the decade. Strip away all the hype, controversy, and attendant craziness surrounding Frankie -- most of which never reached American shores, though the equally bombastic "Relax" and "Two Tribes" both charted well -- and Welcome to the Pleasuredome holds up as an outrageously over-the-top, bizarre, but fun release. Less well known but worthwhile cuts include by-definition-camp "Krisco Kisses" and "The Only Star in Heaven," while U.K. smash "The Power of Love" is a gloriously insincere but still great hyper-ballad with strings from Anne Dudley. In truth, the album's more a testament to Trevor Horn's production skills than anything else. To help out, he roped in a slew of Ian Dury's backing musicians to provide the music, along with a guest appearance from his fellow Yes veteran Steve Howe on acoustic guitar that probably had prog rock fanatics collapsing in apoplexy. The end result was catchy, consciously modern -- almost to a fault -- arena-level synth rock of the early '80s that holds up just fine today, as much an endlessly listenable product of its times as the Chinn/Chapman string of glam rock hits from the early '70s. Certainly the endless series of pronouncements from a Ronald Reagan impersonator throughout automatically date the album while lending it a giddy extra layer of appeal. Even the series of covers on the album at once make no sense and plenty of it all at once. While Edwin Starr's "War" didn't need redoing, Bruce Springsteen's "Born to Run" becomes a ridiculously over-the-top explosion that even outrocks the Boss. As the only member of the band actually doing anything the whole time (Paul Rutherford pipes up on backing vocals here and there), Holly Johnson needs to make a mark and does so with appropriately leering passion. He didn't quite turn out to be the new Freddie Mercury, but he makes a much better claim than most, combining a punk sneer with an ear for hyper-dramatic yelps.